The oven shown is a “Conveyorized” oven. The oven has a conveyor of some specific design to carry a specific part through the heat chamber. In applications where a cooler is needed to reduce the temperature of the product prior to the next processing stage, the conveyor design may require being separated into two conveyors with a transfer section between the heat zone and the cool zone. LOADING can be automatically by robot, pick and place, dumping, or transfer from another conveyor. Manual loading of some parts is also used. The conveyor load end must be long enough and appropriately accessible for whatever method is used to place product on the conveyor to enter thhe oven. >>UNLOADING can also be automatic or manual. The unload end is designed to present the product to the next stage of operation. HEAT TRANSFER to product can be from the top down or bottom up with the intent of passing heated air through the product and the conveyor. Some designs use air from one side to the other or both sides to the middle of the conveyed product. If air is not appropriate, radiated heat can also be used. SUPPORT AND TRANSFER of product depends on the shape and weight of parts and the volume to be processed in a given time. The basic “Time and Temperature” profile for the product determines the number and length of zones that would be used in a conveyorized oven. 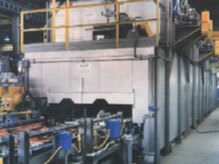 EXPANSION AND TAKE-UP are factors that determine design of the conveyor and oven as a system. A multitude of conveying types such as, metal belt, twin chain, chain on edge, fixtures and flights, can be used and each has its own method for driving and accommodating expansion from heat and general wear. ACCESSIBILITY is an important consideration for maintenance and product inspection purposes. Pre planning for access to certain areas in the heating process can save time and money in the long term effective use of conveyorized ovens.